Going against the grain can be risky, especially since that wheat-farmer's lobby's the only reason you even got into office, junior senator. 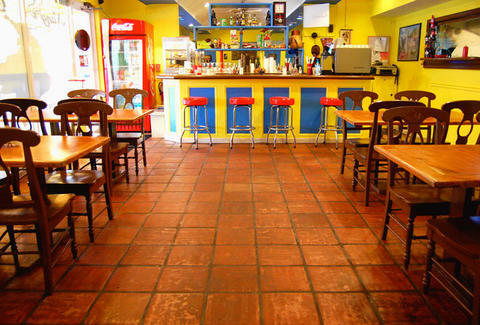 For a little resto bravely going against the glitzy grain of South Beach, hit Nany's Cafe. Plating simple, traditional Colombian favorites, Nany's looks the part, with a big map of the homeland on the front window, stone tile floors, simple wood furniture, patriotic yellow and blue walls, vintage Coca-Cola stools at the bar, and shelves with Colombian lollipops called Bon Bon Bums, also a subsection of vagrants who used to be well-off stay-at-home moms. The apps menu delivers some unique soups, like Sancocho de Gallina (hen, rib, and fish stew) and Mondongo (tripe soup, which they thoughtfully call "honeycomb") as well as traditional Colombian snacks like pork/blood sausage, or pork skin (each with a corn griddle), and papas rellenas: savory meat stuffed inside fried crushed potato balls, small enough for Spuds Webb to run pickup with. Entrees're meat-intensive, with highlights like the house specialty Bandeja Paisa (grilled steak with red beans, rice, pork skins, fried egg, plantains, and corn cake), seafood like langostinos in a garlic sauce, and pork chops either grilled, or fried Cali-style, resulting in Spicoli chops. For that thirst thing, there're house wines and Colombia's Aguila beer, and they're serious about their fruit smoothies and shakes, offering interesting options like Columbian-imported soursop, passion fruit, blackberry, lolu (a tart fruit with a furry kiwi-like skin), and mango -- a dancer so compelling he even got Ellen DeGeneres to go against her grain.